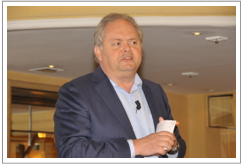 In October 2014, an international group of CIOs, senior executives and world renowned speakers gathered at one of the premier hotels in Munich to discuss the latest in disruption and design. Disruption is happening all around and is triggered by the advances in Social, Mobile, Analytics, Cloud and smart ‘Things’ (SMACT). Customers are changing their behavior in response and companies are keen to find out how to (re)design their organization to survive and thrive in the face of this change. This page will give you an overview of what was discussed and describe some of the insights that were shared amongst the attendees. their minds, connect with peers and interact with the speakers. He explained the importance of events like these by saying that in today’s business environment, more is needed than just operational focus: leaders need insight and inspiration to keep up, to speed up. And speed just keeps increasing. 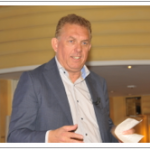 The host of the event, Sogeti CTO, Michiel Boreel followed up and made this very clear by highlighting a quote by Jack Welch: If the rate of change on the outside exceeds the rate of change on the inside, the end is near. If you are interested to continue the discussion or be involved in our research on this topic please contact us at D2D@Sogeti.com. We love to help you create inspiring internal meetings to discuss the reality of acceleration and disruption in your industry.Further your insights and make them practical. The disruptive potential of new technologies is growing at a staggering speed. And challengers in the market are more vigorous than ever. The combination of these new possibilities and the rise of new competitors are the main drivers that are accelerating innovation. This is the reason why leaders put technology on top of their list of factors that will determine their organization’s future. Carlota Perez, economist, states that any technology always goes through an initial installation phase, where risk and expansion are characteristic, then followed by the ‘golden age’ of that technology, where it’s more about using the technology to reinvent the established order. The transition is a time of chaos and crisis. This happened with railroads, electricity and now ‘the information age’. When the New York Times wanted to examine how to deal with the changing world of newspapers, the outcome was much more revolutionary than expected. The report, leaked to the press, stated clearly that the way forward for the Times was not to design a new channel or digital service, but to completely reimagine what it means to be a news organization in todays world. The disruption is not at the edge, it’s at the core of the organization. The entire ecosystem has been disrupted. Another industry, another report, with exactly the same outcome: A Pentagon think tank published a study named "Creative Disruption" (June 2014). In that report we read that the rules of the game in the defense industry have fundamentally changed and that the ecosystem is disrupted. From The New York Times to the Pentagon, every organization is confronted with disruptive change. Looking at the toolset – from collaborative platforms, the industrial internet, advanced analytics, cloud to new mobilities – there is an abundance of opportunities for everyone. But courage to change the design of products, services, business models, and the organization itself, is required. No guts, no glory. Finally, van Doorn warned that overconfidence is an organization’s biggest enemy, and he made one thing very clear in his introduction: If your attitude is ‘Wait and See’, you’re basically inviting someone to make you irrelevant. > Click here to download the Design to Disrupt report and other Sogeti publications. 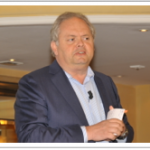 Forrester Principle Analyst Ted Schadler colored the Customer Obsession part of the D2D program by sharing insights from his new book The Mobile Mind Shift. This shift corresponds to the expectation that people can get what they want in their immediate context and moments of need. Customers and employees are making this shift, now. It means that the battle for a customer’s attention will be waged in mobile moments — anytime that customer pulls out a mobile device and spends a few seconds on your or someone else’s app. Most marketing and IT leaders still think “Which mobile apps should we build?” and “What devices do we support?” That is a path to failure since mobile is about much more than apps and devices. A different way of thinking about mobile strategy is needed. The true meaning of mobile access is not about the devices and apps we use now but the change in attitudes they are creating in the minds of millions of customers and employees. Whether you lead an IT or a marketing organization, it’s time to expand your focus beyond the rapidly changing world of devices and the apps that run on them. > Understanding the mobile usage and behaviors of your customers and employees. > Translating those behaviors into application designs that deliver real utility. > Identifying the best processes and technologies for your mobile application development initiatives. > Supporting your dynamic, increasingly global and mobile workforce. > So build a solid business justification and craft a strategy that fits your level of mobile marketing maturity. > Take the Mobile Marketing Maturity self-assessment to find out where you stand compared with your competitors. Nokia, being disrupted itself, is still looking to become a disrupter again. With the world now filled with billions of sensors and trillions of connections, new intelligent software and analytics should lead to improved lives and Nokia’s ambition is to play an important role in that. Innovations in technology are promising great new things, such as connected cars, self-organizing networks or a true ‘sensing’ world. The programmable world promises to bring life to physical objects, opening new opportunities for engagement and interaction. Utopian scenarios of the world optimizing itself around the life and preferences of each user are coming closer and closer. Before this can be a reality, a few things will need to be taken care of such as even better connectivity, more sensing and actuation capabilities, intelligence distributed in the machines, security and energy management. True broadband mobile internet, that can be 10000 times faster than 4G, will bring within reach long promised things such as smart eyewear that allows interaction withall ‘things’, smart mobile robots optimizing manufacturing and even precision agriculture bringing radically improved yield. Each in turn revolutionary developments when they materialize. Ultimately, Kauppinen argued, the goal of design for this connected world is to stop us from continuously looking at our mobile devices, to lift our heads up again and interact with the world directly instead of looking down at out mobile devices. An interesting remark, considering it’s coming from Nokia. John Hogan, from IBM, came to explain the thinking behind Watson. Watson, the famous cognitive system from IBM is making great leaps in computing by analyzing large datasets and deriving intelligent answers from them. Watson still does not ‘think’ in the way people do, but it’s definitely much more advanced than any existing traditional, text-matching based system. There is still a massive amount of unused data and Watson would help people make sense of it by supporting the approach humans have: Observe, interpret, evaluate and then decide. This is actually still quite hard for technology to do, balancing human designed algorithms, self learning and hard statistics. Making sense of human language is quite a feat thanks to the ambiguities that are embedded in it. IBM is positioning Watson as the ultimate human enhancement in areas such as healthcare, drug discovery, law etc. Combining all available data from an industry to bring the best and most applicable knowledge right to the person who needs it. For example helping doctors diagnose and treat patients, backed up by all the up-to-date medical research and case history. Now that Watson is proving its worth, IBM is working hard to bring it to the market and make it available for anyone to use: you can now sign up and load your own data into Watson and start asking questions using the API. The future will prove how revolutionary this new era will be for technology, business and mankind. Microsoft’s Tim O’Brien pulled out all the stops to show examples of how real companies are embracing the great capabilities technology brings today. Packaged in seven rules for the new IT, he talked about everything from data to devices and from security to the role of IT. He spoke of how in some companies the marketing officer becomes the CIO and how in other companies the IT service employees are ‘embedded’ into the regular organization to change mindset and interaction across the organization. O’Brien’s seven rules for the new IT are these: > IT will be cheap and plentiful, but new skills will not. As an example, Big Data Architects and Scientist are currently hard to find and the need is real. > Data is the new currency. > IT and Business are in this together. An increasing closeness between CIO and CMO, between business and IT, in sharing responsibility for digital strategy. > IT will compete inside and outside the business. > Sensors and algorithms will create and replace jobs. For example ThyssenKrups elevators using sensors to provide predictive maintenance capabilities. The elevator is coaching the repair person in doing the right maintenance. > Perimeter control is over, but perimeter safety is still important. > And, dream as you want, but physics, economics and governments still have the final say. Things like network latency or government mandated data sovereignty cannot be ignored: they are a reality that impact your choices. Everybody has seen the digital success stories of Apple, Google and Facebook. But what are other companies doing? Can we find digital leaders there too? And what are they doing? We’re at an inflexion point and what’s coming is going to be quite dramatic. Technology is the most important thing happening to business today. It’s not the only thing, but it’s much more transformative than any other thing happening to business. So how do we deal with that? What can we learn from the leaders? Didier Bonnet Is very clear: he has never seen a company successfully transform into a digital master without clear top-down vision and mandate. A pure bottom-up transformation does not exist. That said, adoption and engagement ARE key ingredients, just like governance and – of course – technology. The situation today is essentially the same however more intense at the same time. Schumpeter’s waves accelerate and the creative destruction of anything that is not customized is rampant. Commodities, goods and services have become commoditized, and next up are the much-desired experiences. We are in an ever-increasing rush to provide customization in context. What we are aiming for is to provide true transformations, as ultimate customized offering. This brings a major shift in thinking. We used to think that: ... goods and services were enough; ... we could invent great products & mass produce them for years; ... materiality conferred advantage; ... the best way to manage was to optimize These truths of the past are now, dead wrong. Now instead we must: ... stage experiences and guide transformations; ... mass customize & constantly renew our offerings; ... fuse the real with the virtual; ... adopt a way of managing with the intent to vitalize the enterprise. Real value can only be provided through experiences and transformations, the rest will become commodity. In this context, Joseph Pine puts forward The Law of Vitality: only the enterprise that attains vitality, through its incessant destructive recreation, produces the wealth necessary to survive. future’ by showing off his digitally connected home. Anyone has probably seen the glam videos of futuristic looking homes that self-regulate themselves around the wants and needs of the home owner. Jochen showed what it looks like in real life, today, working in real time. With a down-to-earth attitude, Burkhardt showed how he could remotely switch on and off lights in the living room, move the shades, check his mailbox, etc. Through automation his home heating knows when to switch on, thanks to signals from his car. Through a sensor on the roof, the house knows when to close the shutters. Better than that, the sensor-data is shared with others, so they too can automatically regulate their shutters based on the amount of daylight. The plants water themselves, inside but also in the garden. Webcams cover the house and everything is available online. The demo served as a great example of how technology is available to really do practically anything you think of. But what about security and privacy? Burkhardt doesn’t worry too much: everything is behind bank-level security and the cloud helps make it secure. And when do we all have this? That may take another ten years, Burkhardt concedes. Hunting for Billion dollar startups Mark Plakias from Orange Institute talked about their latest research into Unicorns, Startups and Giants. The report was triggered by observations of so called ‘unicorns’ such as Whatsapp, when it was bought by facebook for 19 billion dollars. How could such a small company of fifty people be worth that much money? What does this mean? Orange Institute looked at 60 technology unicorns and found that they represent a total valuation of over $230 billion. Is that a bubble? Perhaps: there was a 67% increase in the number of billion dollar startups from 2012 to 2013 alone. In any case, the disruption is real: existing organizations are being upended by these young companies. Often disruption looks like nonsense to the incumbents: it just doesn’t seem to make any sense. Until for example in the case of WhatsApp, you look at the text-message business that is being disrupted: the value of that market makes the total price paid for Whatsapp seem trivial. Yet one nagging question remains: what prevents these disruptors from being disrupted themselves? WhatsApp is now handling 80% of the worldwide text messages, but could another app replace WhatsApp overnight? And what does the one billion dollar buy for a startup? Strong teams, intellectual property, aggressive growth curves and a valuable network. It also positions the startup in the right position to start playing in adjacent activities that are almost naturally disruptive: crossing segments, connecting markets and bringing new value. Established companies are looking at all this and try hard to attach themselves to the innovation and disruption coming out of the startup world: either by trying to adopt a similar culture, by building their own incubators. To survive, they have to get closer to the ideas, the energy and the moment of disruption. Uber is an example of a disruptor: shaking up the taxi business worldwide. The taxi-type app grew out of San Francisco in 2009 to now over 200+ cities, with every week 7 to 10 new cities added. Triggered by a bad experience of a normal cab, the founders designed Uber to bring a better experience using regular cars. Fast forward to today, and a map of San Francisco shows the reality of disruption: there are now at least one but often two or three transportation opportunities per block facilitated by Uber. Uber Germany spoke about the growth, the ambition and the challenges for Uber. Embedded into Uber is the constant interaction with the customers about quality of the experience, which makes it radically different than old school taxis. Looking at customer satisfaction, this is exactly what makes Uber outcompete regular cabs: from a negative experience to a positive one. And why does the taxi industry not take the challenge and try to beat Uber at their own game? Why are they fleeing to regulators and lawmakers? It’s easy, Uber says, they just want to protect their business and use any means they can to do it. Meanwhile, Uber continues to dream up new revolutionary offerings that may be the next big thing for them: Uber Icecream anyone? Uber packages? Uber … ? Dubai is a city that has experienced explosive growth in the past three decades. It grew from a small sleepy fishing village to a major buzzing city in a short time and serves as the perfect backdrop to build a fast-growth, ambitious company such as Emirates Group. Mainly known for its airline, Emirates aims to reinvent the air travel experience. It is a thirty-year-old company, working hard to live a startup-life. Before they could do this, they had to address the complex and fragmented IT environment, with hundreds of databases, application servers and even a large variety of software development tools. To bring change, a project was started with the aim to get closer to the business, implement end-to-end IT service processes, set up an IT governance framework and better address the people dimension of IT. Using strong values as a base, the IT department is moving up from getting the basics right and delivering to expectations to really enable and innovate the business. This also means to work with partners more intimately and professionalize how ideas materialize into real change. Brainstorming, an innovation funnel and hackathons create new triggers for the business to innovate. In one hackathon, 60 new apps were created in just 24 hours. And it doesn’t stop here: there are still many new ideas cooking in Emirates’ innovation lab. Frog is a famous design agency and Patrick Kalaher shared his experience and advice about design. Using a detailed example of public trash-collection sites, he examined what it looks like to really reinvent, reexamine the function and design of things we all know well. Kalaher started off by looking at the following six observations: > Device design is breaking long-held rules. > Mobile networks are glitchy. > The Internet of Things is messy and complicated, and failure can be expensive. > Pervasive computing is starting to offend people. > Connected device scenarios are hard work. > Emergent behavior has unintended real- world consequences. It’s a Dirty New World, where things are messy and unpredictable. You simply can’t design for every possible failure state so the design has to somehow be ready for that. Also, the Internet of Things is a team sport, with many players and devices interacting. To be disruptive you have to design for disruption, Kalaher concludes. So how can you design for this new world? Interestingly, the lessons from designing physical objects carry over well into all kinds of design in today’s age: > Don’t design the whole thing. Reuse what exists, connect to others. > Design for modular collaboration. > Be thoughtful about the value chain and the service chain. > Design at three scales: unit scale, local scale, planetary scale. From looking at the detailed technology to the general purpose computing platforms to large-scale global view of interconnected systems and data. > Adopt a Baysian strategy: Guess at the answer, acquire data and adjust strategy. Repeat! > Include the hackers. To compete today, business leaders need a revolution in thinking: a steady stream of disruptive strategies and unexpected solutions to stay ahead of the game. In his book Disrupt: Think the Unthinkable to Spark Transformation in Your Business, leading innovation consultant and frog Fellow Luke Williams demonstrates how to generate those strategies and deliver those solutions. Williams outlines a way of thinking that will help business leaders to produce and implement ideas that alter the trajectory of a business and revive stagnant markets. Disrupt explores why the most unexpected ideas draw the least competitors and offer the greatest potential. The book shows how to combine fluid creativity with analytical rigor in a simple five-stage process for successfully disrupting any market: 1. Craft a disruptive hypothesis: Be wrong at the start to be right at the end. 2. Define a disruptive market opportunity: Look where no one else is looking. 3. Generate several disruptive ideas: Make the ordinary unexpected. 4. Shape them into a single, disruptive solution: Avoid novelty for novelty’s sake. 5. Make a disruptive pitch that will persuade internal or external stakeholders to invest or adopt what you’ve created. Under-prepare the obvious, over-prepare the unusual. What does innovative design look like? How can you design innovation? To examine these questions, Daan Roosegaarde took the stage and dazzled the attendees with examples, insights and ideas that break with the established order. Roosegaarde, the techno-poet, artist, entrepreneur and self-proclaimed “hippie with a business plan” operates from the Netherlands and Shanghai. Innovation is his passion and perhaps also his driving force. This is very clear if we combine two of his credos as follows: “get the hell out of here with your opinion, we need a proposal”, because “innovation is the longing to jointly discover something.” It is impossible to tickle yourself, you have to do that together. We can enforce innovation by connecting, by learning from one another. To do so, we have to pass through three thankless stages: that of ‘it’s impossible’, that of ‘it’s not allowed’ and that of ‘it already exists’. Disruption is the new normal I believe what everybody said, it’s correct. However, disruption carries with it that it is unpredictable. But many disruptions are predictable. There will be companies that know more about our customers in the future. Car companies know the self-driving cars are around the corner. Taxi companies knew that Uber was around the corner. We should at least focus on the disruptions we know are coming, rather than hunting in the desert for the ones we don’t know. My second point is even more positive: Digital or Dead. It’s as simple as that. Didier Bonnet called it an inflection point, but if you don’t move now, you’ll be in for the toughest time your company has ever seen. The bad news part is that digital or dead doesn’t only apply to the enterprise as a whole, but also to the IT department specifically. If the IT department doesn’t change radically, it will be condemned. Just like the enterprise will be condemned if they don’t change. To keep IT alive you need to understand that IT will have different role. The old ‘Business’ and ‘IT’ was a simple model: business tells IT what to do and IT delivers. The new way says that there is the second IT (hopefully the same), which has the role to teach the business about what technology can do for them. IT has to take the role of co-creator in business in the future. That also implies new capabilities for IT: to know more about the evolution of technology and the impact on business, to teach and inspire and to coach business through the change. There is a tension there, for if you inspire the business with something radically innovative, you will have to actually deliver. If you advise on the safe side, too conservatively, you will surely be able to deliver but you have not addressed the need of business to survive. Compete with the right price, service level, etc. Relate, as the connection between Business and IT is often still tense. Then, you need to be able to do new things. To have the right structure and processes to introduce change. Finally, THEN you can innovate. “If you do these five things, then IT will be the business partner that is needed, that will help the company survive”, concludes Hessler. 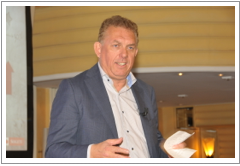 Continued involvement Beyond this yearly CIO summit, Sogeti organizes many other activities: in-house presentations, events, workshops, roundtables and more, to advance your understanding and innovation. The yearly Executive Summit is by invitation only but there are many other events throughout the year at different locations. You can ask your Sogeti Account Executive to keep you updated on the most recent research activities, events and publications. Also, if you’d like to schedule a meeting to discuss any of the topics presented here and explore what it may mean for you and your organization, you can approach your Sogeti Account Executive or contact SogetiLabs – VINT directly.